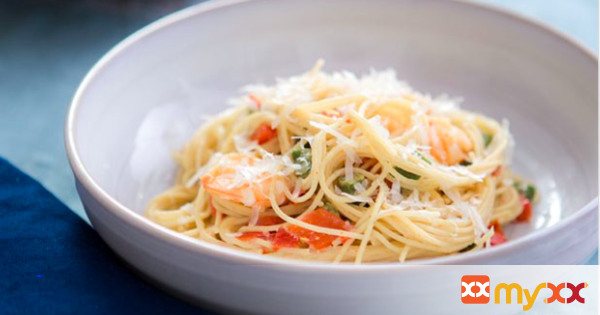 Angel hair pasta with sautéed lemon shrimp, red bell peppers and asparagus in a light cream sauce; topped with parmigiano-reggiano cheese. 1. Bring a small saucepan of water to a boil. Add asparagus; boil for 30 seconds. 2. Drain; rinse under cold water and set aside. Bring a large pot of water to a boil. 3. Heat olive oil in a large skillet over medium-high heat. Add asparagus, shrimp, red pepper and red pepper flakes; cook 5 to 7 minutes or until shrimp is cooked and vegetables are tender, stirring occasionally. 4. Reduce heat to medium low. Stir in half-and-half and salt. Heat thoroughly, stirring occasionally. 5. Cook pasta according to package directions; drain and return to pot. Juice lemon to yield 2 tablespoons lemon juice and grate lemon peel to yield 2 teaspoons lemon zest. Add shrimp mixture to hot pasta; toss. 6. Add lemon juice and lemon zest; toss. Transfer to a serving platter; sprinkle with cheese and serve.